Homeschooling affords a great amount of flexibility; flexibility in our schedule, our curriculum, and also in WHERE we school. We have learning spaces this year, and I'm finding that not having an actual "school room" is creating a culture of learning throughout our home. We're living a lifestyle of learning, and as my children get older I believe this will work well for our family. If you've followed the blog for any amount of time, you also know about my efforts to deepen our homeschool through simplification. Getting rid of so much clutter makes it easier to focus on what we want to learn. It not only frees up physical space, but mental space as well. In a quick poll of readers on my Facebook page, the responses were varied about schoolrooms. Some people had dedicated school rooms and love them. Others don't have them, but wish they did. Some have them, but never use them. We have storage areas and learning spaces - but no dedicated "school room" per se. The first image in this post is a view into my former piano studio - now primary learning area. It has resources for the current year, a map tracing and activity table, our piano, and a mini command center for mom (printer and a few supplies). All of our read-alouds and curriculum pieces for Classlcal Conversations are in this bookshelf. I am vowing NOT to add to this shelf as the year goes along. I planned well for the school year and other than trips to the library, I don't predict adding many resources. Geography is a BIG DEAL in our homeschool. This repurposed coffee table holds our globe, map tracing materials, and other supplies. It also serves as a work space for my son should he so choose (most often he is sitting at the kitchen table, but if he wants to spread out on the rug in this room or work at this table he's free to do so). This room is also a great place for us to relax when we are working on SQUILT music appreciation or listening to our CC memory work. Our 13 year old needs a private space to spread out, store her materials, and spend the necessary quiet time needed for her Challenge studies. She works in a section of our upstairs bonus room. This room also has a storage closet and bookshelf just for her school books. (It also is room we use for crafting, watching movies, and general family activities) I'm very thankful for this space - it used to be a dedicated homeschool room when the kids were younger. An over the door shoe holder is the place for pencils, tape, stickers, hole punches, Sharpies, and any other little supplies. I love being able to work at the kitchen table and simply open the door to the basement to access supplies, and then CLOSE the door so it's out of sight! This is the storage/learning arrangement we have for this year. As always, I'm open to change if something isn't working, but I'm hopeful this will take us through another year of homeschool. Now I want to know: Do you have a dedicated school room? 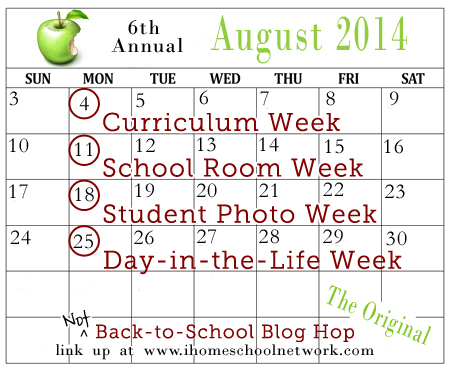 See what other homeschoolers do for school spaces... visit the iHomeschool Network's Not Back To School Blog Hop.